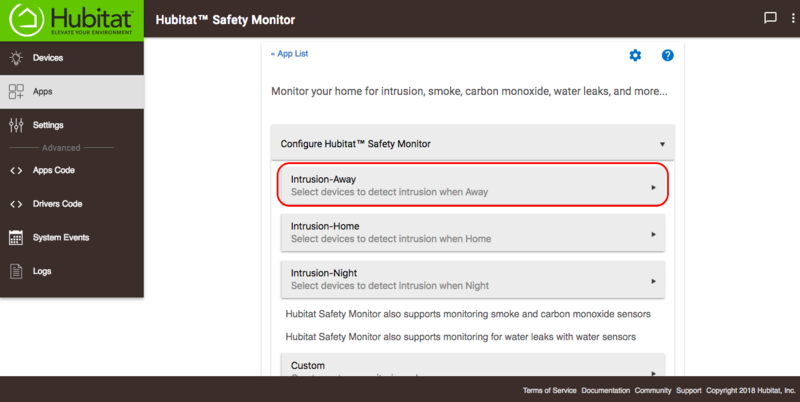 Hubitat™ Safety Monitor lets you set intrusion alerts, safety warnings and other customer alerts. Your alerts can include text messages, push notifications, alarms, flashing lights and more. If you have Zigbee or Z-Wave leak detectors connected to your Hubitat Elevation™ hub, then Hubitat™ Safety Monitor can also send you notifications about detected leaks and even automatically shut off your water main with a compatible Zigbee or Z-Wave shut-off valve. Unarmed-Away: Your hub is in away mode but your alerts turned off. Armed-Night: Your hub is in Night mode and your alerts are turned on. Unarmed-Night: Your hub is in Night mode but your alerts are turned off. Armed-Home: Your hub is in any other mode and your selected alerts are turned on. 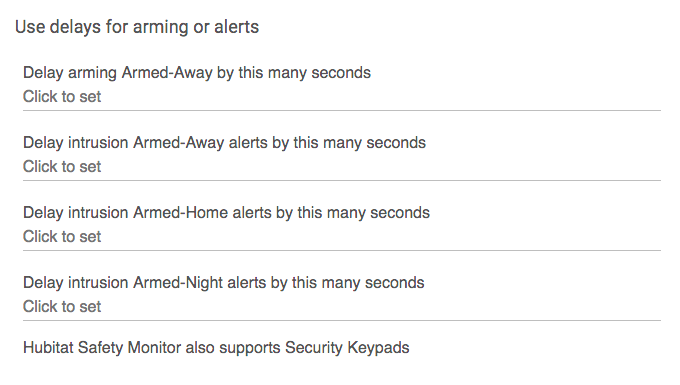 Unarmed-Home: Your hub is in any other mode but your selected alerts are turned off. As an example, let setup Intrusion-Away. You can use these same steps to setup your Intrusion-Home alerts, Intrusion-Night alerts, alerts for Smoke and Carbon Monoxide, and Water alerts. 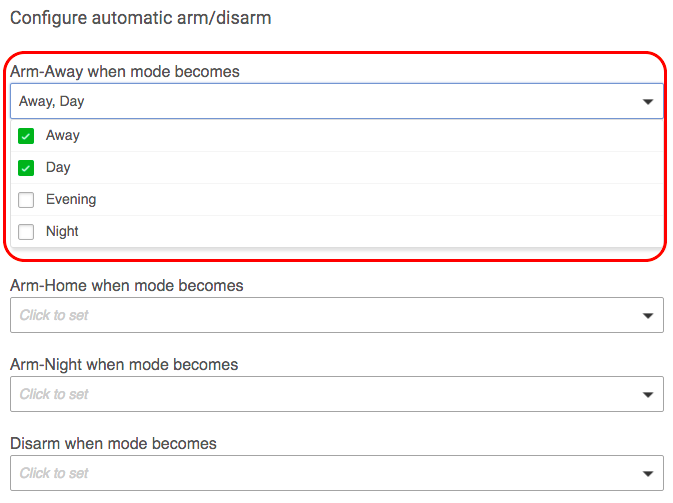 Once your first alert has been setup, you will see options to configure your armed states as further explained. Open/load Hubitat™ Safety Monitor in the Hubitat Web Interface. NOTE: You can set different intrusion alerts for when you are home and when you are away. Many people like to set all of their motion and contact sensor to alert them when they are away, and only allow windows and door sensors to send alerts when they are home. Next, select the sensors you want to alert you if triggered while your hub is in the Armed-Away state. If you want to use every sensor in your system, toggle the Use every open/close, motion and shock sensor switch to On. If you only want certain sensors active, then you will select them individually. Choose from your open/close sensors, motion sensors and shock (window break) sensors. First write the message you wish to send with the alert is triggered, such as “ALERT! Hubitat™ Safety Monitor has been triggered”. You can include %device% to include alert device name, %value% to include alert value, %time% to include alert time, and %date% to include alert date. Next, add the phone number you wish to text using SMS format: +1<10 digits> (For example 1-555-867-5390 would be +1<5558675309>). You can add multiple number by separating them by a comma. There is a limit of 10 text messages per day. Select if you would like to repeat sending this alert message until the alert is canceled. If so, enter the time in seconds you would like to wait between repeated messages. Select the siren(s) you want to use from the dropdown menu, then select the function you want to trigger. You may select multiple functions (such as strobe and siren) if your device has multiple warning capabilities. NOTE: Any lights you choose to flash must have the capability. You can determine if the lights are capable of flashing by looking at the driver settings. If a flash button exists, the driver is capable of flashing your lights. 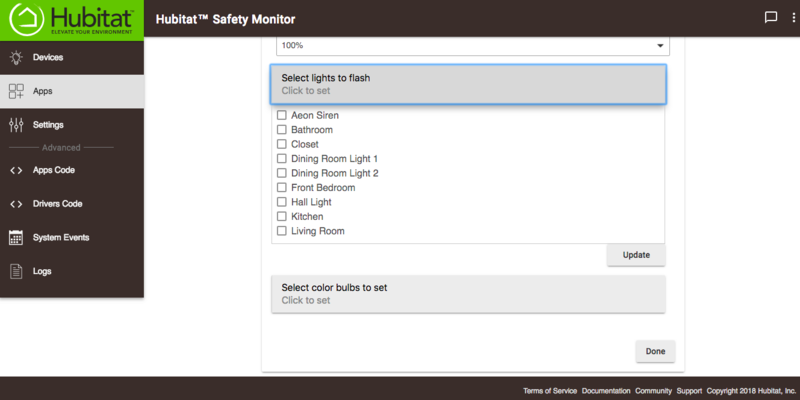 If you select a light to flash that does not have the capability, it will disable all of your HSM alerts. Next, select the speech or music device(s) you want to send the message to. Click Done to save your Audio Alerts configurations. When you have configured the Intrusion Alerts you want, select Done. 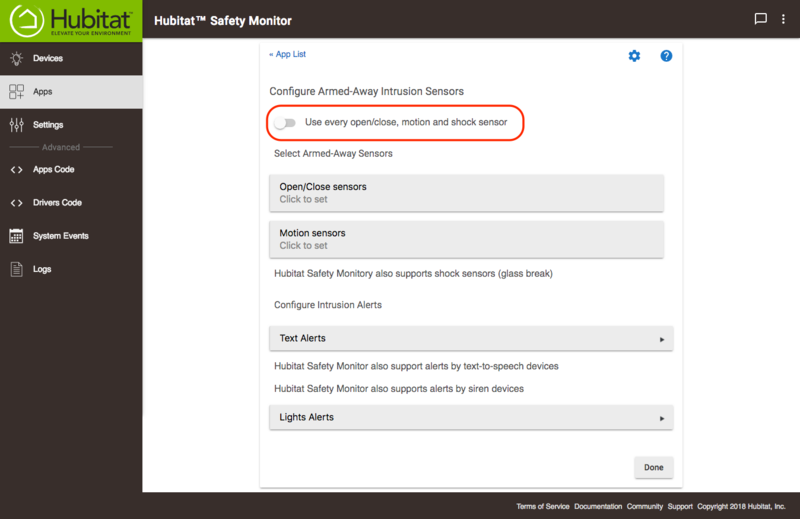 After setting up an alert, you will notice a few differences in the Hubitat™ Safety Monitor details page. At the top you will see the current armed state in orange and below the Custom monitoring rules, the configuration option Configure Arming/Disarming/Cancel Options is now available. Finally you will now see options for manually arming, disarming and changing your monitoring states. If you would like your system to automatically arm itself during certain modes, you'll set that here. Use the dropdown menus to select which modes will arm your Away, Home and Night states. You can select multiple modes for each of these states. You can also select the modes that will disarm your Intrusion alerts. In certain cases, you may want to delay armed states or alerts. For example, if you arm your Away state using a button in your house, you may want build in a 20 second delay to allow yourself enough time to get out of the house before it is actually armed. Conversely, you can delay your alerts for a few seconds to give yourself a chance to disarm your system with a kill switch if you accidentally trip the alarm. To add the delay, simply enter the number of seconds you wish to delay the arming or the alert in the appropriate box. Buttons are a convenient way to manually arm or disarm your intrusion alerts. Many people keep a button by their bed to arm/disarm their Home alerts when they go to bed or wake up. Others use a hidden button near their door to arm/disarm their Away alerts. Use the designated check boxes to select the button devices you would like to use to arm your different states or to disarm the system. Setting your Cancel Alerts Buttons or Switches is very important. First, if you set a delay for your intrusion alerts, you’ll want an easy way to cancel the alert before it triggers after the delay. 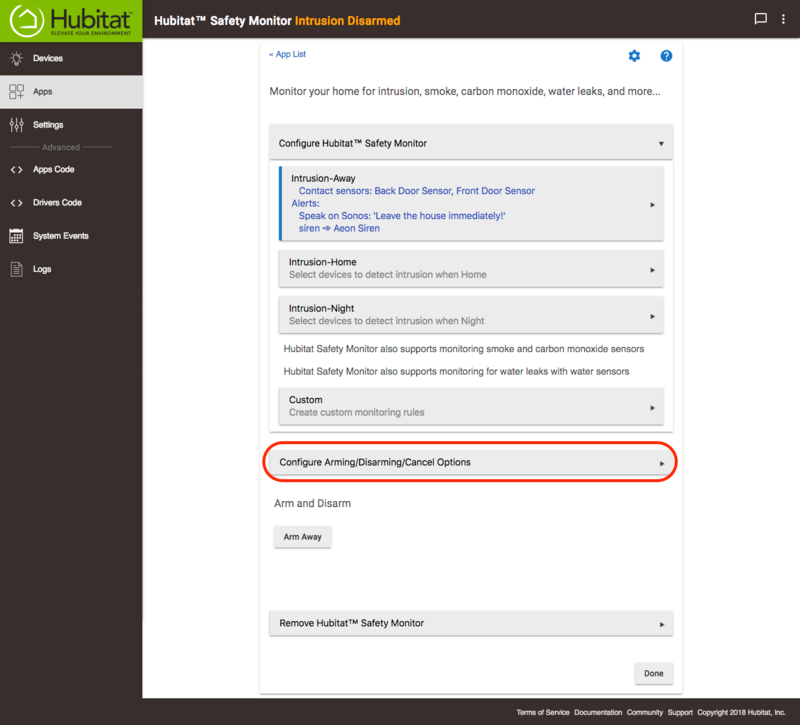 Second, if your alerts are triggered (especially sirens), you’ll want a way to shut them off without having to go into the Hubitat Web Interface.You have a choice of canceling your alerts using buttons or switchesSelect the buttons or switches you want to use to cancel your alerts. When you are finished configuring your arm/disarm options, select Done. 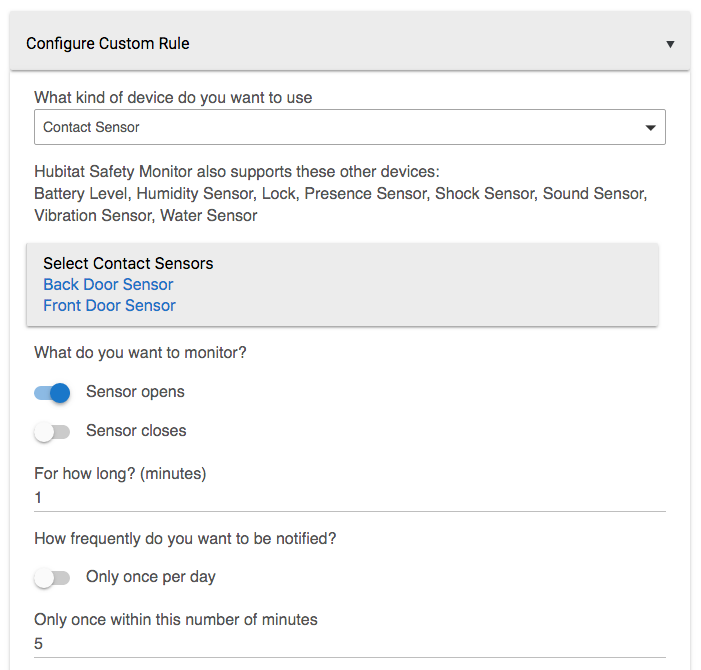 Selecting an alert in this section will notify you if one of your contact sensors is left open when you try to arm your system. Setting up these alerts works exactly the same as configuring intrusion alerts. Choose from text alerts, audio alerts, siren alerts and lights alerts. When you are finished configuring your alert options, select Done. In Hubitat™ Safety Monitor, click new custom monitoring rule. Name your Custom Monitoring Rule and click continue. When you select a type of device, a list of options will appear. Select the specific device(s) you would like to monitor (some devices, such as battery level, give you a toggle switch to select all devices). Then select the specific states that will trigger an alert. This varies by device. Next, select the type of Alerts you would like to receive. These options are exactly the same as you will find for setting Intrusion Alerts. These restriction may be used together. For example, the rule could apply only between Sunrise and Sunset on Tuesdays, during Day mode. When your custom monitoring rule is complete, select Done. You will see a new child app with the name you gave to your custom rule has now been added below the Hubitat™ Safety Monitor app. Use this link to edit your new rule. This page was last edited on 15 March 2019, at 05:28.